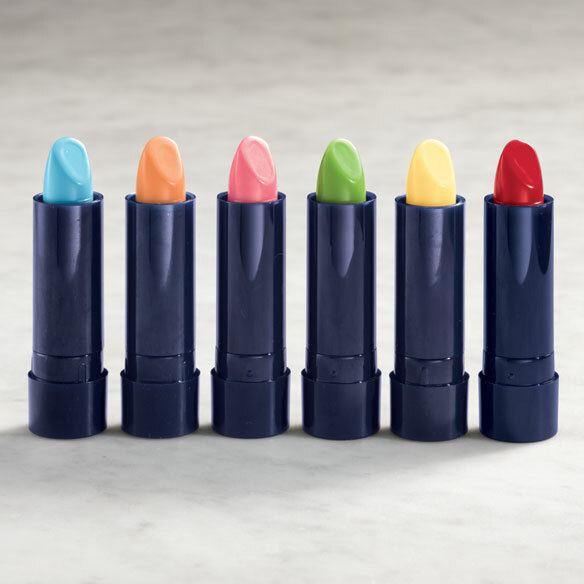 12-hour Moodmatcher™ color changing lipsticks change color with your body chemistry. Extra-moisturizing SPF 6 mood lipstick formula with aloe vera and Vitamin E stays put all day. 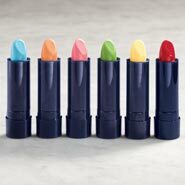 Set of 6 color changing lipstick includes green, light blue, red, yellow, orange and pink. Ricinus Communis (Castor) Seed Oil, Caprylic/Caprric Triglyceride, Euphorbia, Cerifera (Candelilla) Wax, Petrolatum, Cetyl Acetate/Acetylated Alcohol, Lanolin, Ozokerite, Propylene Glycol, Isopropyl Lanolate, Aloe Barbadensis Leaf, Propylparaben, Propyl Gallate, Tocopheryl Acetate, May contain: Fragrance (Parfum) Benzyl Benzoate, Geraniol, Iso Eugenol, Red 27 (Cl 45410), Red 21 (Cl 45380), Yellow 10 (Cl 47005), Red 30 (Cl 73360), Blue 1 (Cl 42090), Red 6 (Cl 15850), Titanium Dioxide (Cl 77891), Iron Oxide (Cl 77489) (77491) (77492) (77499), Red 7 (Cl 15850), Yellow 6 (Cl 15985), Yellow 5 (Cl 19140), Barium Sulfate (Cl 77120), Manganese Violet (Cl 77742), Mica (Cl 77018). ago and used it for over 5 years. Every shade, every time!! On me: blue turns red; pink turns rose. The moodmatchers are the only lipsticks I use because the color stays on my lips all day. I love the variety of colors to my lips. Please keep them in your catalog. This is the only place I can get them. I love this lipstick and have been using it for years. It really stays on and has several pretty colors. I like it so well I ordered more. It goes on so smooth, you don't even have to blot it, it is not sticky, and it stays on all day and I use it everyday. FINALLY FOUND THE RIGHT LIPSTICK! I am very pale and like the blue best for my complexion. It comes out a soft red. My lips are moisturized and soft and although the color fades a bit during the day I still like the lighter shade too. So easy to reapply. I don't need a mirror. No feathering too. I do use the anti=feathering clear lip for the base, blot my lips, apply the blue stick, blot and reapply. Blot again and that's it for the day. Love it! The different colors are fun. I did notice the red does not last as long as the other colors. The green one is a nice medium pink on me. Great for dry lips and you don't have to reapply often. I liked this product so much I purchased additional boxes to give as gifts. My favorite are the green and yellow. They change to the perfect color on my lips! Glad These Are Still Available! Lipstick - Lip Gloss...Not a shaver! Ordered these from somewhere LONG AGO and had given up hope of being able to replace them. Bought 2 sets! They are GREAT! Good colors and smoothing-soothing on lips. So glad to have found them again! These stain my lips, so last ALL day. Can use moisterizing or sunscreen lip "balms/sticks" on top and doesn't affect the color staying power. I Love These! I have been using this product for several years, and simply can't do without it. My lips never dry out, and the various colors are light, true to color, and easy to apply. Please keep this product in stock forever! works great!been using this for years. Love these lipsticks!I apply mine once in the moarning and once late afternoon.can use with a lipliner too.I wouldn,t wear it before any surgury tho as they need to see your lipcolor to monitor you while asleep.Have fun with all the colors!I bought some for my friends and family they love it too!! These look good and cheerful on my mirror vanity tray in my bathroom. I just put a little silk flower by them and it cheers me up when ever I see them. I used to use chap stick as my lips get dry a lot, so these keep my lips moist and add color to them. Great product, I will sure reorder and buy some for gifts. works great! been using this for years. You can use it on your cheeks to. apply lightly tho.be careful not to smug it on your face or fingers it,ll stay there allday. I have been using this product for several years now. The lipstick really does change color. For instance the green tube goes on pink. fun, fun, fun. This lasts for several hours if you don't eat right away. Be sure and carry a tube with you in case you do. Leaves lips very soft. I am glad that i found this product again. I have used this product in the past and am glad to have found it again. It stays on as advertised unless you wipe it off, and then it doesn't always all come off. It is great for my lips as well. love the colors. I love this lipstick so much, look funny color but when use it's different.it's very nice pink and lasts for a long and long time. Make you have pink lip all day! Most lipstick turns orange on me, but this product looks good and maintains a good color. These "mood" lipsticks were all the rage 15 years ago. My mother loved to shock her friends by pulling out her GREEN lipstick! They moisturize your lips and leave a long-lasting color behind that stays for hours. I use it under my regular lipstick. This complete set, gives you the full color range from a light pink (yellow) to mid-rose (green) to darker (blue). A little pricey but really only [$] each. I absolutely love these lipsticks. The pink and red were not for me, so I gave them to my fair colored child. She also absolutely loves hers as well. Love the surprise of color after it is applied; needs very little touch ups; but after a few hours it needs moisture because of dryness. I will continue to use it as I like it staying on, even though it fades a little. I have used it in the past. It stays on for a long time - no need to keep checking to add lipstick.